Mitotic exit comprises a complex series of events that includes sister chromatid segregation, mitotic spindle disassembly, nuclear-envelope re-assembly and chromosome decondensation (Wurzenberger and Gerlich, 2011). How these events are coordinated during mitotic exit is still an open question. The emerging picture is that exiting mitosis requires the specific engagement and activation of protein phosphatases, including ser/thr phosphatase protein phosphatase 1 (PP1) (Funabiki and Wynne, 2013; Rosenberg et al., 2011). While PP1 exhibits broad specificity, it acts in a highly specific manner by forming stable complexes, known as holoenzymes, with a host of regulatory proteins that direct PP1 activity towards specific substrates and localize PP1 to specific regions of the cell (Hendrickx et al., 2009; Bollen et al., 2010; Peti et al., 2013; Peti and Page, 2015; Choy et al., 2014; O'Connell et al., 2012). A detailed understanding of how key PP1 regulators bind and direct PP1 activity during distinct stages of the cell cycle is still largely missing. Ki-67 is widely used as a prognostic marker for many cancers (Dowsett et al., 2011; Lin et al., 2016; Sobecki et al., 2016), yet for decades, its molecular function remained largely unknown. Recently, it was shown that one role of Ki-67 is to function as a ‘DNA surfactant’, preventing individual chromosomes from collapsing into a single chromatin mass upon nuclear envelope disassembly by binding directly to the surface of chromatin (Cuylen et al., 2016). A second recently discovered function is that it binds and regulates the activity of PP1 during mitosis using the canonical PP1 RVxF small linear motif (SLiM) (Booth et al., 2014). The only other protein that exhibits any sequence similarity with Ki-67 near its RVxF motif is RepoMan (recruits PP1γ onto mitotic chromatin at anaphase, also known as cell division cycle associated 2, CDCA2), a nuclear-specific protein that was discovered for its ability to specifically recruit PP1γ to chromosomes at anaphase onset and, like Ki-67, is upregulated in many cancers (Trinkle-Mulcahy et al., 2006; Vagnarelli, 2014). During mitotic exit, PP1, in particular PP1γ (PP1 isoforms include PP1α, PP1β, PP1γ and PP1γ2; ≥ 85% identity between isoforms), is essential for histone dephosphorylation, nuclear-envelope reassembly and chromatin remodeling (Qian et al., 2011; Vagnarelli et al., 2006; Wurzenberger et al., 2012; Qian et al., 2013; Vagnarelli et al., 2011). These PP1γ-specific processes are mediated largely by the Ki-67:PP1γ and RepoMan:PP1γ holoenzymes. Two key unresolved questions are how do these regulators assemble mitotic phosphatases and how are these interactions dynamically regulated in both space and time? Answers to these questions will provide novel opportunities for the development of Ki-67:PP1 and RepoMan:PP1 specific therapeutics for cancer. In this report, we demonstrate how Ki-67 and RepoMan form mitotic exit phosphatases, how they distinguish between distinct PP1 isoforms and how the assembly of these two holoenzymes is dynamically regulated by Aurora B kinase during mitosis. Ki-67 (3256 aa) and RepoMan (1023 aa) bind PP1γ to form isoform-specific holoenzymes (Booth et al., 2014; Trinkle-Mulcahy et al., 2006). Previously, we showed that these proteins exhibit sequence similarity in only a very short region, of about 40 residues (Figure 1A) (Booth et al., 2014). This region includes the canonical RVxF SLiM that is critical for PP1 binding (505RVSF508, Ki-67; 392RVTF395, RepoMan; more than 70% of PP1 regulators contain the RVxF SLiM) (Trinkle-Mulcahy et al., 2006; Vagnarelli et al., 2011). Because recent efforts to understand how PP1 activity is directed by its >200 distinct regulators has revealed that residues outside the RVxF motif are also essential for PP1 holoenzyme formation and function (Peti et al., 2013; O'Connell et al., 2012; Terrak et al., 2004), we reasoned that this entire region was critical for PP1 binding. Using isothermal titration calorimetry (ITC), we showed that Ki-67496-536 and RepoMan383-423 bind PP1γ7–323 with a 1:1 stoichiometry and with nearly equivalent affinities (Figure 1B, left; Figure 1—figure supplement 1; KD = 193 ± 16 nM and 133 ± 5 nM; respectively; all ITC experiments are summarized in Table 1). We also showed that extending this domain does not enhance binding (Table 1). Finally, NMR spectroscopy experiments with RepoMan confirmed that all residues in this conserved region interact with PP1 (Figure 1—figure supplements 2,3). Together, these data suggest that Ki-67496-536 and RepoMan383-423 bind PP1 using identical mechanisms and that this conserved region, which extends beyond the RVxF SLiM, constitutes the full PP1 interaction domain. (A) Cartoon depicting Ki-67 and RepoMan domains. The only region of homology between the two proteins is indicated in blue. The sequences corresponding to the homologous regions are shown below, with conserved residues highlighted in grey. Ki-67 residues that interact directly with PP1 are underlined. The sequences corresponding to the RVxF and ΦΦ SLiMs (blue highlight) and the newly discovered KiR-SLiM (orange) are shown. (B) left, binding isotherm of Ki-67496-536 with PP1γ7–323 (KD, 193 ± 16 nM; the KD of the corresponding domain of RepoMan383-423 with PP1γ7–323 is 133 ± 16 nM); right, binding isotherm of the ΔKiR-SLIM, RepoMan383-404, with PP1γ7–323 (KD, 661 ± 160 nM). (C) Crystal structure of the Ki-67:PP1γ holoenzyme. PP1γ is in grey and Ki-67496-536 is in pink with the 2Fo–Fc electron density map contoured at 1σ (2.0 Å); no electron density was observed for Ki-67 residues 496–503 (pink dotted line) and 536. PP1 residues in green correspond to PP1 secondary structure elements helix A’, loop 1 and helix B. (D) Close-up of the Ki-67 (pink) and RepoMan (blue) interaction with PP1. Ki-67 residues 503–516 and RepoMan residues 390–403 bind the PP1 RVxF and ΦΦ binding pockets (cyan surface; the Ki-67 and RepoMan RVxF and ΦΦ SLiM residues are labeled and in italics). Ki-67 residues 517–535 and RepoMan residues 404–422 bind the newly defined KiR-SLiM binding pocket (beige surface). The black dotted line highlights the area shown in E. (E) The hydrophobic and polar interactions between Ki-67 (pink sticks) and PP1γ (grey sticks; surface). Hydrogen bonds and salt bridge interactions are indicated by dotted lines with the interacting residues labeled. (F) HMMER-derived sequence logo of the Ki-67/RepoMan PP1 binding domain, with the KiR-SLIM highlighted in beige (hydrophobic residues, black; acidic residues, red; basic residues blue; glycine/serine/threonine, green; asparagine/glutamine, pink). Isothermal titration calorimetry (ITC) measurements. 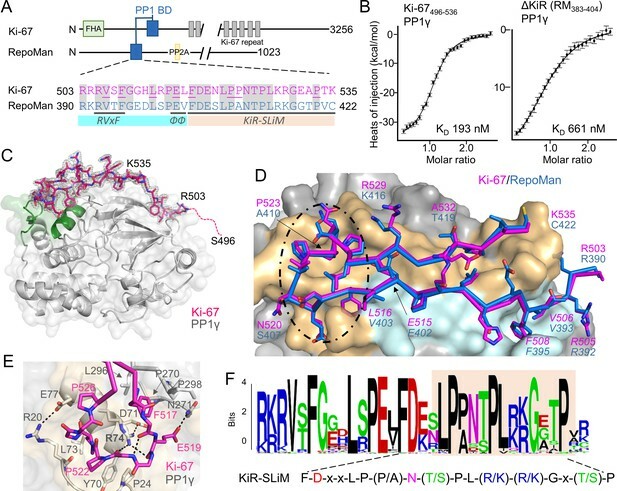 The Ki-67/RepoMan residues C-terminal to the canonical RVxF motif are not present in any other PP1 regulator whose holoenzyme structure is known, suggesting these regulators bind PP1 using a novel mechanism. To identify this mechanism, we determined the crystal structures of the Ki-67496-536:PP1γ7–308 and RepoMan383-423:PP1γ7–308 holoenzymes complexes to 2.0 Å and 1.3 Å, respectively (Figure 1C,D; Figure 1—source data 1). As predicted by the ITC and NMR studies, Ki-67 and RepoMan bind PP1 using an identical mechanism. Namely, Ki-67 and RepoMan form a classical β-hairpin on the top of PP1 that extends from the PP1 RVxF binding pocket towards the PP1 N-terminus and then back again (Figure 1D; ~2600 Å of buried surface area). The structures also show that two established PP1-specific SLiMs—the RVxF-SLiM (Egloff et al., 1997), 505RVSF508Ki-67/392RVTF395RM and the ΦΦ-SLiM (O'Connell et al., 2012), 515EL516Ki-67/402EV403RM —bind directly to PP1 in the RVxF and ΦΦ binding pockets (Figure 1D). However, as predicted, the Ki-67/RepoMan residues C-terminal to these SLiMs (aa 517–535/404–422) also bind PP1 and do so in a manner never observed for any other PP1 regulator (Figure 1D,E). 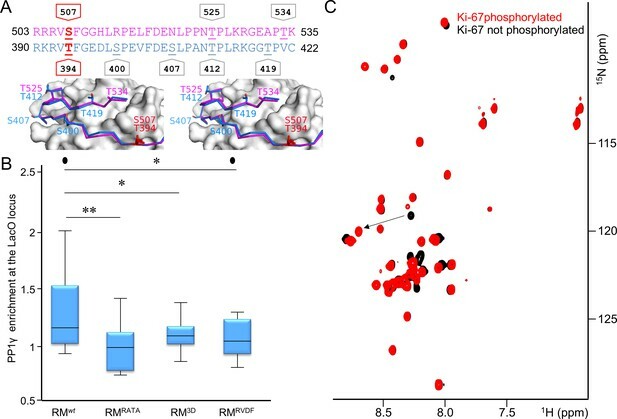 Residues F517Ki-67/F404RM and P523Ki-67/A410RM are anchored to PP1γ via two hydrophobic pockets while multiple residues in Ki-67/RepoMan bind the side chains of R74PP1, Y78PP1 and Q294PP1 via polar and salt bridge interactions. This orders PP1γ L1 (Figure 1C), a loop that is generally more dynamic in most free PP1 and PP1 holoenzyme structures as evidenced by its higher B-factors and less well-defined electron density. Although F517Ki-67/F404RM are the most buried residues in both complexes, mutating this residue to an alanine does not negatively affect RepoMan function (Figure 1—figure supplement 4). Because these residues are critical for binding (removing them decreases the affinity ~five-fold; Figure 1B, right), we termed this novel PP1 interaction SLiM the KiR-SLiM (Ki-67-RepoMan SLiM). The general KiR-SLiM motif, FDxxLP(P/A)N(T/S)PL(R/K)(R/K)Gx(T/S)P was determined using HMMER (Figure 1F) (Finn et al., 2015). Critically, a subsequent search of the UniProtK/Swiss-Prot database (de Castro et al., 2006) using the most degenerate version of the KiR-SLiM identified only Ki-67 and RepoMan proteins. This demonstrates that, unexpectedly, only these two PP1 regulators likely use the KiR-SLiM interaction surface on PP1. How PP1 regulators selectively recruit specific PP1 isoforms to distinct substrates remains an important, open question. PP1 has three isoforms—α, β and γ—that differ primarily in the last ~30 residues of their C-termini; because of this, it has been generally assumed that regulators that bind preferentially to one isoform interact directly with the C-terminus (Takagi et al., 2014). In vivo, Ki-67 and RepoMan bind specifically to the β- and γ-isoforms, but not the α-isoform, of PP1 (Booth et al., 2014; Trinkle-Mulcahy et al., 2006; Vagnarelli et al., 2011). As PP1γ is recruited more efficiently than PP1β (Booth et al., 2014), we focused our study on the PP1α and PP1γ isoforms. We confirmed this in vitro using ITC, which showed that the affinity of both Ki-67496-536 and RepoMan383-423 for PP1α7–330 is ~four–six-fold weaker than for PP1γ7–323 (Table 1, Figure 1—figure supplement 1). To elucidate the molecular basis of isoform selectivity, we first tested the role of the PP1γ C-terminal residues. Deleting the last 15 residues of PP1γ had no impact on binding (Table 1, Figure 1—figure supplement 1). We then tested if RepoMan binds PP1α differently by determining the structure of the RepoMan383-441:PP1α7–300 holoenzyme (2.6 Å; Figure 1—source data 1). The structures are identical (backbone RMSD = 0.22 Å), demonstrating that the isoform selectivity is due to one or more of the six amino acid differences in the PP1 catalytic domain (residues 7–300). Only two of these differing residues are located near the Ki-67/RepoMan:PP1 interface, Arg20/Gln20 (γ/α) and Lys23/Arg23 (γ/α; Figure 2A). We generated variants of both isoforms in which one or both of these residues were mutated to that of the other (PP1γR20Q, PP1γR20Q/K23R and PP1αQ20R) and determined their affinities for Ki-67496-536 and RepoMan383-423 using ITC (Figure 2B; Table 1; Figure 1—figure supplement 1). The change of only a single amino acid, R20/Q20, switches PP1γ into a ‘PP1α’-like isoform (PP1γR20Q; KD = 2239 ± 124 nM; ten fold weaker binding) and PP1α into a ‘PP1γ’-like isoform (PP1αQ20R; KD = 199 ± 46 nM; similar binding to that of PP1γ). Although R20 does not interact with Ki-67 or RepoMan directly, it confers selectively through its interactions with PP1 which order the L1 loop. Namely, the Arg20 sidechain forms a salt bridge with PP1 residue Glu77 and makes a planar stacking interaction (cation/π interaction) with Phe81. Neither interaction is possible with Q20, as the side chain is both uncharged and too short. Thus, only in PP1γ is this pocket ordered and readily available for binding, which allows for the isoform specific interaction of Ki-67 and RepoMan. Ki-67/RepoMan isoform specificity is defined by PP1 residue 20. (A) Overlay of PP1 from the Ki-67496-536:PP1γ7–308 (magenta:yellow), RepoMan383-423:PP1γ7–308 (blue:orange) and RepoMan383-423:PP1α7–300 (lavender:pink) complexes. R20 (PP1γ), Q20 (PP1α), E77 (PP1α/PP1γ) and F81 (PP1α/PP1γ) are shown as sticks. (B) Cartoon illustrating the PP1 variants generated for this study; colored as in A. The resulting KD values of Ki-67 and RepoMan titrated with the different PP1 variants are shown. (C) Subcellular distributions of GFP-PP1 fusions. HeLa cells were transfected with the indicated GFP-PP1 variants. The green fluorescence was visualized by confocal microscopy. Anaphase chromosomes were detected using Hoechst and live imaging. (D) Quantification of the relative enrichment of PP1 variants on chromosomes in C. Average and standard deviation are shown (T-test using Welch’s correction). (E) HEK293T cells were transfected with GFP-PP1 variants. The micrococcal-nuclease-treated cell lysates from nocodazole arrested cells were used for GFP trapping. The traps were processed using immunoblotting. (F) Chicken DT40 cells carrying a LacO array inserted in a single locus were transfected with GFP:LacI or GFP:LacI:Ki-67301-700wt constructs (green) and with RFP:PP1wt or RFP:PP1R20Q (red). GFP:LacI:Ki-67301-700wt and RFP:PP1wt both accumulate at the LacO array, however the RFP:PP1R20Q fails to accumulate together with GFP:LacI:Ki-67wt at the locus. Scale bar 5 μm. (G) Quantification of the enrichment of PP1 at the locus from the experiment in (F) (Mann-Whitney test) between: 1) GFP:LacI/RFP:PP1wt and GFP:LacI:Ki-67wt/RFP:PP1wt or 2) GFP:LacI:Ki-67wt/RFP:PP1wt and GFP:LacI:Ki-67wt/RFP:PP1R20Q. To confirm that PP1α and PP1γ residue 20 defines isoform specificity in vivo, we used immunofluorescence microscopy. Transiently expressed GFP-PP1γ was enriched at anaphase chromosomes (Figure 2C,D; Figure 2—figure supplement 1). In contrast, GFP-PP1α showed a more diffuse distribution. Changing this single residue in either PP1γ (PP1γR20Q) or PP1α (PP1αQ20R) reversed this localization (Figure 2C,D; Figure 2—figure supplement 1). To confirm that the observed isoform specificity was due to a direct interaction between Ki-67/RepoMan and PP1, we used GFP-Trap and tethering experiments. GFP-traps showed that GFP-PP1γ and GFP-PP1αQ20R bind endogenous Ki-67 in prometaphase-arrested cells, while GFP-PP1α and GFP-PP1γR20Q bind much more weakly (Figure 2E). Similar GFP-traps showed that GFP-PP1γ, GFP-PP1β and GFP-PP1αQ20R bind both endogenous and ectopically expressed RepoMan in prometaphase-arrested cells, while GFP-PP1α, GFP-PP1γR20Q and GFP-PP1βR19Q bind much more weakly (Figure 2—figure supplement 1). Similarly, tethering experiments showed that a GFP:LacI fusion of Ki-67301-700 wt or RepoMan wt results in the recruitment of co-expressed RFP-PP1γ to a LacO array that is integrated at a single locus in DT40 chicken cells. In contrast, RFP-PP1γR20Q fails to localize, demonstrating it no longer binds Ki-67 and RepoMan (Figure 2F,G, Figure 2—figure supplement 2). Remarkably, the R20Q mutation abolishes PP1γ localization as effectively as mutating the canonical RVxF motif in RepoMan to RATA. Together, these data reveal that the isoform specificity of Ki-67 and RepoMan is not defined by residues in the PP1 C-terminus, but instead by a single residue in the PP1 catalytic domain, R20/Q20 (γ/α). This is a fundamental result, as it demonstrates that regulator-specific isoform selectively is not only achieved through interactions with the C-terminus, but also through interactions with the structured catalytic domain. Unlike PP1α, the localization of PP1γ changes dramatically during mitosis, with the bulk of PP1γ relocalizing to chromosomes at anaphase onset. This relocalization is dependent on its ability to bind effectively to Ki-67 and RepoMan (Figure 2C, Figure 2—figure supplement 2) (Trinkle-Mulcahy et al., 2003; Trinkle-Mulcahy et al., 2001) and is regulated by phosphorylation (Figure 3A) (Vagnarelli et al., 2006; Qian et al., 2013; Vagnarelli et al., 2011; Qian et al., 2015). For example, RepoMan S400, T412 and T419 are phosphorylated by CDK1-cyclin B (Vagnarelli et al., 2011; Qian et al., 2015). Mutating these residues to phosphomimetics inhibits PP1γ binding, as evidenced by the inability of EGFP-RepoMan3D to pull-down PP1γ from non-synchronized HEK293T cells [see Figure 3F in Qian et al. (2015)] and an inability of RFP-PP1γ to localize to the LacO locus when co-expressed with GFP:LacI-RepoMan3D (Figure 3B). Notably, the identity of the kinase that phosphorylates the S507Ki-67 and T394RM sites, both of which have been identified in proteomic screens (Dephoure et al., 2008; Nousiainen et al., 2006), has remained elusive. Because Aurora B kinase is redistributed from centromeres to the spindle midzone at anaphase onset and because the S507Ki-67 and T394RM sequences match canonical Aurora B kinase phosphorylation motifs (Kettenbach et al., 2011), we reasoned that these residues are phosphorylated by Aurora B kinase. Using in vitro phosphorylation assays coupled with NMR spectroscopy and mass spectrometry, we showed that both S507Ki-67 and T394RM (Figure 3C, Figure 3—figure supplement 1) are phosphorylated directly by Aurora B kinase. Furthermore, mutating S507Ki-67 and T394RM to a phosphorylation mimetic (Ki-67496-536S507D/RepoMan348-450T394D) profoundly weakens their interactions with PP1 (~25-30-fold reduction in affinity; Table 1). Finally, the expression of GFP-LacI-RepoManT394D results in a significant reduction of the recruitment of RFP-PP1γ to the LacO locus (Figure 3B), i.e., to a level that is nearly identical to that observed for GFP-LacI-RepoManRATA and GFP-LacI-RepoMan3D. These data demonstrate that phosphorylation by Aurora B kinase in (pro)metaphase inhibits PP1γ binding to Ki-67 and RepoMan and, as a consequence, significantly contributes to prevent their premature recruitment to chromosomes. Aurora B kinase phosphorylates Ki-67 S507 and RepoMan T394 to inhibit holoenzyme formation. (A) Stereo image of Ki-67 (magenta) and RepoMan (blue) bound to PP1 (grey) with serine and threonine residues shown as sticks and labeled. The ‘x’ residues of the RVxF motifs, S507Ki-67 and T394RM, are shown and highlighted in red. (B) Chicken DT40 cells carrying a LacO array inserted in a single locus were transfected with different GFP:LacI:RepoMan constructs (green) and with RFP:PP1 (red) and the enrichment of PP1 at the locus was calculated. Both the CDK-1 (3D) and the Aurora B (RVDF) phosphomimetic mutants cause a significant decrease in PP1 accumulation at the locus although less pronounced than the RATA mutant (Mann-Whitney test). (C) Overlay of the 2D [1H,15N] HSQC spectrum of Ki-67496-536(black) and Aurora B kinase phosphorylated Ki-67496-536(red). Peaks that correspond to S507 (black) and phosphorylated pS507 (red) are shown by an arrow. Our study builds on previous work to reveal how two mitotic exit phosphatases (Ki-67:PP1 and RepoMan:PP1) are assembled and recruited to their cellular targets, how they selectively bind the γ-isoform of PP1 and how the assembly of these holoenzymes is controlled by Aurora B kinase phosphorylation. These are key advances as, until this work, there was essentially no molecular data on mitotic phosphatase assembly and function. Our data now explains why the phosphorylation of RepoMan at three distinct sites (S400, S412 and S419) by Cdk1 inhibits PP1 binding (Qian et al., 2015). Namely, it is similar to the mechanism by which Aurora B kinase inhibits Ki-67:PP1 and RepoMan:PP1 holoenzyme formation. All three residues, like the Aurora B targets S507Ki-67 and T394RM, are part of the PP1 interaction motif and their phosphorylation blocks the interaction with PP1, which, in turn, prevents the premature targeting of PP1 to chromatin. This regulation of holoenzyme assembly is critical as the premature targeting of PP1 to chromosomes leads to an increase in chromosome misalignment and a weakened spindle assembly checkpoint (Qian et al., 2015). In contrast, the expression of a PP1-binding mutant of RepoMan in HeLa cells results in extensive cell death, demonstrating the importance of the RepoMan-PP1 interaction for cell viability (Trinkle-Mulcahy et al., 2006). This work also expands the diversity of SLiMs used by PP1 regulators to bind PP1 and demonstrates a novel mechanism by which isoform selectivity is achieved in PP1 holoenzymes, a question that has been under investigation for the last 20 years. That is, Ki-67 and RepoMan selectively assemble with PP1γ because the KiR-SLiM distinguishes between a single residue in PP1: Arg20PP1γ and Gln20PP1α. Finally, since the KiR-SLiM is present in just two regulators, the newly discovered KiR-SLiM binding pocket defines a novel surface on PP1 that is targetable for the development of drugs that inhibit only 1% of the distinct PP1 holoenzymes in the cell (2 of ~200) (Hendrickx et al., 2009). This is of profound interest because both Ki-67 and RepoMan are highly upregulated in multiple cancers (Dowsett et al., 2011; Vagnarelli, 2014). Targeting unique regulator binding pockets is a powerful approach as we recently discovered that the newly discovered LxVP SLiM substrate interaction surface is a well-known drug target site in the ser/thr phosphatase Calcineurin (Grigoriu et al., 2013). Given the diversity of unique interactions that are now being revealed between PSPs and their plethora of regulators, it is now clear that these novel, unique protein:protein interaction sites, especially that defined by the KiR-SLiM, provide immediate opportunities for the design of novel, highly specific therapeutics. The coding sequences of human Ki-67496-536, RepoMan303-515, RepoMan348-450, RepoMan383-441 and RepoMan383-423 were sub-cloned from pGEX4-T3-Ki-67 (Booth et al., 2014) and pEGFP-Repoman (Qian et al., 2013) into the pET-M30-MBP vector containing a N-terminal his6-tag followed by maltose binding protein (MBP) and a TEV (tobacco etch virus) protease cleavage site. Escherichia coli BL21 (DE3) RPIL cells (Agilent; Lexington, MA) transformed with the expression vector for Ki-67 (or RepoMan) were grown at 37°C in LB broth containing selective antibiotics. The proteins were overexpressed by the addition of 1 mM isopropylthio-β-D-galactoside (IPTG) when the optical density (OD600) reached 1.2 and the cultures were grown for an additional 18–20 hr at 16°C. Cells were harvested by centrifugation (6000 xg, 12 min, 4°C) and stored at −80°C until purification. Ki-67S507D and RepoManT394D mutant was generated using the QuikChange site-directed mutagenesis kit (Agilent). The RepoMan383-404 peptide was synthesized and HPLC purified (>95% purity; Biosynthesis, Inc.; Lewisville, TX). PP1γ7-323R20Q, PP1γ7-323R20QR23K and PP1α7-330Q20R were generated using the QuikChange site-directed mutagenesis kit (Agilent). Uniformly 15N and 15N/13C labeled RepoMan348-450 and 15N labeled Ki-67496-536 was produced using the same procedure except that the cells were grown in M9 minimal medium supplemented with 15N ammonium chloride (1 g/L) and/or 13C-D-glucose (4 g/L) as the sole nitrogen and carbon sources, respectively. Cloning, expression and purification of PP1α7–330, PP1α7–300 and PP1γ7-323 was performed as previously described (Choy et al., 2014; O'Connell et al., 2012). Cloning, expression and purification of PP1γ7–308 was performed following the methods described in Choy et al. (2014). E. coli cell pellets containing Ki-67 (or RepoMan) were resuspended in ice-cold lysis buffer (50 mM Tris pH 8.0, 0.5 M NaCl, 5 mM imidazole, 0.1% Triton X-100 containing EDTA-free protease inhibitor tablet [SigmaAldrich; St. Louis, MO]), lysed by high-pressure cell homogenization (Avestin C3 Emulsiflex; Canada) and centrifuged (35,000 xg, 40 min, 4°C). The supernatant was loaded onto a HisTrap HP column (GE Healthcare; Boston, MA) pre-equilibrated with 50 mM Tris pH 8.0, 500 mM NaCl and 5 mM imidazole (Buffer A) and was eluted using a linear gradient of Buffer B (50 mM Tris pH 8.0, 500 mM NaCl, 500 mM imidazole). Fractions containing the protein were pooled and dialyzed overnight at 4°C (50 mM Tris pH 8.0, 500 mM NaCl) with TEV protease to cleave the His6-MBP tag. The cleaved protein was incubated with Ni2+-NTA beads (GE Healthcare) and the flow-through collected. The protein was then heat purified at 95°C (600 rpm, 15 min), the supernatant collected and concentrated and, in a final step, purified using size exclusion chromatography (SEC; Superdex 75 26/60 [GE Healthcare]) pre-equilibrated in ITC Buffer (20 mM Tris pH 8, 500 mM NaCl, 0.5 mM TCEP, 1 mM MnCl2) or NMR Buffer (20 mM Tris-acetate pH 6.5, 150 mM NaCl, 0.5 mM TCEP). Fractions were pooled, concentrated and stored at −20°C. RepoMan constructs were purified identically. To purify the Ki-67496-536:PP1γ7–308, RepoMan383-423:PP1γ7–308 and RepoMan383-441:PP1α7–300 holoenzyme complexes, a cell pellet expressing PP1γ7–308 was lysed in PP1 Lysis Buffer (25 mM Tris pH 8.0, 700 mM NaCl, 5 mM imidazole, 1 mM MnCl2, 0.01% Triton X-100), clarified by ultracentrifugation and immobilized on Ni2+-NTA resin. Bound His6-PP1 was washed with PP1 Buffer A (25 mM Tris pH 8.0, 700 mM NaCl, 5 mM imidazole, 1 mM MnCl2), followed with a stringent wash containing 10% PP1 Buffer B (25 mM Tris pH 8.0, 700 mM NaCl, 250 mM imidazole, 1 mM MnCl2) at 4°C. The protein was eluted using 100% PP1 Buffer B and purified using SEC pre-equilibrated in ITC Buffer (20 mM Tris pH 8, 500 mM NaCl, 0.5 mM TCEP, 1 mM MnCl2). Peak fractions were incubated overnight with TEV protease at 4°C. The cleaved protein was incubated with Ni2+-NTA beads (GE Healthcare) and the flow-through collected. The flow-through was combined with excess Ki-67496-536 (or RepoMan383-423, RepoMan383-441) concentrated and the complex purified using SEC (pre-equilibrated in crystallization buffer: 20 mM Tris pH 8, 500 mM NaCl, 0.5 mM TCEP). Fractions containing the holoenzyme complex were concentrated (RepoMan383-423:PP1γ7–308, 8.4 mg/mL; Ki-67496-536:PP1γ7–308 6.4 mg/ml) and subsequently used for crystallization trials. All NMR spectra were recorded on a Bruker Avance II 500 spectrometer equipped with a TCI HCN z-gradient cryoprobe (298 K). NMR samples were prepared in NMR buffer (20 mM Tris-acetate pH 6.5, 150 mM NaCl, 0.5 mM TCEP) containing 10% (v/v) D2O. The sequence-specific backbone assignment for RepoMan348-450 (0.25 mM concentration) was obtained by analyzing 2D [1H,15N] HSQC, 3D HNCA, 3D HN(CO)CA, 3D HNCACB, 3D CBCA(CO)NH and 3D (H)CC(CO)NH (τm= 12 ms) spectra. All spectra were processed using NMRPipe (Delaglio et al., 1995) and analyzed using SPARKY (Goddard and Kneller, 2004). The Ki-67496-536:PP1γ7–308 holoenzyme crystallized in 1.9 M Sodium Malonate pH 4.0 (hanging drop vapor diffusion at 4°C). Crystals were cryo-protected by a 60 s soak in mother liquor supplemented with 40% glycerol and immediately flash frozen. Data for the Ki-67496-536:PP1γ7–308 holoenzyme crystal structure were collected to 2.0 Å at beamline 12.2 at the Stanford Synchrotron Radiation Lightsource (SSRL) at 100 K and a wavelength of 0.98 Å using a Pilatus 6M PAD detector. The Ki-67496-536:PP1γ7–308 crystal data was processed using XDS (Kabsch, 2010), Aimless (Evans and Murshudov, 2013) and Truncate (French and Wilson, 1978). The data was analyzed using phenix.xtriage and the intensity statistics suggested merohedral twinning (twin fraction of 0.48) with the space group of P61 and twin law h, -h-k, -l. The structure was solved by molecular replacement using Phaser (McCoy et al., 2007) as implemented in PHENIX (Zwart et al., 2008) (PDBID 5INB was used as the search model). The model was completed using iterative rounds of refinement in PHENIX (McCoy et al., 2007) and manual building using Coot (Emsley et al., 2010) (Ramachandran statistics: 95.05% favored, 4.95% allowed). The final structure was refined in PHENIX with the twin law. The RepoMan383-423:PP1γ7–308 complex crystallized in 1 M Sodium Malonate pH 4.3 (sitting drop vapor diffusion method at 4°C). Crystals were cryo-protected by a 30 s soak in 1 M Sodium Malonate pH 4 supplemented with 40% glycerol and immediately flash frozen. Data for the RepoMan383-423:PP1γ7–308 holoenzyme crystal structure were collected to 1.3 Å at the beamline 12.2 at Stanford Synchrotron Radiation Lightsource (SSRL) at 100 K and a wavelength of 0.98 Å using a Pilatus 6M PAD detector. The RepoMan383-423:PP1γ7–308 crystal data were processed using XDS (Kabsch, 2010), Aimless (Evans and Murshudov, 2013) and Truncate (French and Wilson, 1978). The structure was solved by molecular replacement using Phaser (McCoy et al., 2007) as implemented in PHENIX (Zwart et al., 2008) (PDB ID 1JK7 (Maynes et al., 2001) was used as the search model). A solution was obtained in space group P6122. The model was completed using iterative rounds of refinement in PHENIX and manual building using Coot (Emsley et al., 2010) (Ramachandran statistics: 96.3% favored, 3.7% allowed). The RepoMan383-441:PP1α7–300 holoenzyme crystallized in 100 mM Sodium Malonate pH 4.0, 12% PEG 3350. Crystals were cryo-protected by a 30 s soak in mother liquor supplemented with 30% glycerol and immediately flash frozen. Data were collected to 2.6 Å at the National Synchrotron Light Source (BNL) Beamline X25 at 100 K and a wavelength of 1.1 Å using Dectris pilatus 6M detector. Data were indexed, scaled and merged using HKL2000 0.98.692i (Otwinowski and Minor, 1997). The structure was solved by molecular replacement using Phaser as implemented in PHENIX (PDB ID 4MOV was used as the search model (Choy et al., 2014; McCoy et al., 2007; Zwart et al., 2008). A solution was obtained in space group P212121. The model was completed using iterative rounds of refinement in PHENIX (McCoy et al., 2007) and manual building using Coot (Emsley et al., 2010) (Ramachandran statistics: 95% favored, 5% allowed). His6-tagged-PP1 constructs (PP1α7–330, PP1γ7–308, PP1γ7–323, PP1γ7-323R20Q, PP1γ7-323R20QR23K and PP1α7-330Q20R) used for ITC were purified as follows. PP1 was lysed and purified using Ni2+-affinity chromatography and SEC (pre-equilibrated ITC buffer, 20 mM Tris pH 8, 500 mM NaCl, 0.5 mM TCEP, 1 mM MnCl2). Ki-67 or RepoMan (30 μM to 40 μM) was titrated into PP1 (3 µM to 4 μM) using a VP-ITC micro-calorimeter at 25°C (Malvern; United Kingdom). Data were analyzed using NITPIC, SEDPHAT and GUSSI (Scheuermann and Brautigam, 2015; Zhao et al., 2015). Aurora Kinase B (AuKB) was expressed and purified as a GST-tagged protein as previously described (Qian et al., 2013). In-vitro phosphorylation of Ki-67496-536 or RepoMan348-450 was achieved by incubation with AuKB at a molar ratio 20:1 in phosphorylation buffer (20 mM HEPES pH 7.5, 0.5 mM EDTA, 2 mM DTT, 20 mM MgCl2 and 10 mM ATP). The reaction was allowed to proceed for 16 hr at 30°C. Following incubation, the protein was concentrated and purified using SEC. The phosphorylation of both Ki-67496-536 and RepoMan348-450 was confirmed using ESI-MS.
HMMER (Finn et al., 2015) (using the rp75 UniProt database) identified proteins with sequences similar to the RepoMan PP1-binding domain. 107 sequences were identified, spanning a diversity of species, from human to Xenopus. WebLogo was used to generate the resulting logo. The UniProtKB/Swiss-Prot database was then scanned using ScanProsite (de Castro et al., 2006) using the pattern F-D-x-x-[LMK]-P-[PA]-[NSDAI]-[TSA]-P-[LIV]-[RKQC]-[RK]-G-x-[TSIAL]-[PS] to identify proteins that contain this motif, which resulted in the identification of only Ki-67 and RepoMan proteins. HeLa Kyoto cells were maintained in DMEM supplemented with 10% FBS. DT40 cells carrying a single integration of the LacO array (Vagnarelli et al., 2006) were cultured in RPMI1640 supplemented with 10% FBS and 1% chicken serum. For RNAi treatments, HeLa cells in exponential growth were seeded in 6 well plates with polylysine-coated glass coverslips and grown overnight. Transfections were performed using Polyplus jetPRIME (PEQLAB; Germany) with the indicated siRNA oligos and analyzed 48 hr later as previously described after 3 hr nocodaole arrest (Vagnarelli et al., 2006). For the rescue experiments HeLa cells at 50% confluence were transfected with 400 ng of plasmid DNA and 50 nM of siRNA oligonucleotides and analyzed 48 hr post-transfection after 3 hr nocodaole arrest. Transient transfections for DT40 were conducted as previously described (Qian et al., 2013). For quantification of the enrichment at the Laci locus, cells were fixed with paraformaldehyde 24 hr after transfection. HeLa cells were seeded in a 4-Chamber 35 mm Glass Bottom Dish with 20 mm microwell, #1 cover glass (Cellvis) and transfected with X-tremeGENE 9 DNA Transfection Reagent (Roche) according to manufacturer's protocol. The DNA was stained with Hoechst 33,342 (Tocris; United Kingdom) for live imaging. Confocal images were acquired with a Leica TCS SPE laser-scanning confocal system mounted on a Leica DMI 4000B microscope, equipped with a Leica ACS APO 63X 1.30NA oil DIC objective and a live-imaging chamber ensuring 37°C and 5% CO2. Cells were fixed in 4% PFA and processed as previously described (Rosenberg et al., 2011). 3D data sets were acquired using a cooled CCD camera (CoolSNAP HQ2 firewire) on a wide-field microscope (Eclipse Ti, NIKON) with a NA 1.45 Plan Apochromat lens. The data sets were deconvolved with NIS-Element AR (NIKON). Three-dimensional data sets were converted to MIP in NIS-Element AR, exported as TIFF files, and imported into Adobe Photoshop for final presentation. RepoMan 3A mutant: 5’TTGGAGAGGACTTAGCCCCGGAAGTGTTTGA3’ on GFP:RepoManT412A,T419A oligo-resistant. Images of prometaphases (or anaphase for the PP1γ experiment) from transfected cells were acquired, the 3D stacks were deconvolved and projected using MIP. A 10 × 10 pixel area contained within the chromosomes was used to measure the total intensity of the signal. Three different measurements per mitosis on different chromosomes and 3 different cytoplasmic areas were collected and averaged. An area of the same size outside the cells was used to identify the background signal in each image, and this value was subtracted from the measurement of the chromosome and cytoplasmic area. The GFP (or RFP for PP1γ) intensity on the chromosomes was then normalized against the cytoplasmic intensity. For quantification of PP1-binding at the LacO locus, images of interphase transfected cells were acquired and the intensity of PP1 staining at the GFP spot was calculated relative to the average nuclear intensity. The 3-dimensional data sets obtained at the same exposure were projected as mean intensities. A 12 × 12 pixel area containing the GFP spot was used to measure the total intensity of the signal. An area of the same size was used to identify the background signal in each cell, and this value was subtracted from the measurement of the nuclear and spot area. The data were analyzed using the Mann-Whitney U test. All NMR chemical shifts were deposited in the BioMagResBank (BMRB 25981). Atomic coordinates and structure factors have been deposited in the Protein Data Bank (Ki-67:PP1γ, PDBID 5J28; RepoMan: PP1γ, PDBID 5INB; RepoMan:PP1α, PDBID 5IOH). Trends in Biochemical Sciences 35:450–458. Acta Crystallographica Section A 34:517–525. University of California, San Fransisco. Journal of Biological Chemistry 276:44078–44082. Bioorganic & Medicinal Chemistry 23:2781–2785. Journal of Biological Chemistry 289:22877–22887. Journal of Cell Biology 172:679–692. Molecular Biology of the Cell 14:107–117. Journal of Cell Science 114:4219–4228. Advances in Experimental Medicine and Biology 773:401–414. Nature Reviews Molecular Cell Biology 12:469–482. Journal of Cell Biology 198:173–183. Methods in Molecular Biology 426:419–435. Thank you for choosing to send your work entitled "Molecular Assembly of the Ki-67 and RepoMan Mitotic Phosphatases: Regulators of Chromatin Organization and Structure" for consideration at eLife. Your initial submission has been assessed by Tony Hunter in consultation with three members of the Board of Reviewing Editors. Although the work is of interest, we are not convinced that the findings presented have the potential significance that we require for publication in eLife. The main linkage between this paper and the original paper in eLife, which justifies this as a Research Advance, is the crystal structure of the Ki-67 motif bound to PPI. This new structure is very similar to that of the homologous RepoMan motif bound to PP1γ, which would have been predicted based on the very strong similarity of the PP1-binding motifs of these proteins. In the rest of the manuscript the authors used the RepoMan:PP1 interaction as a proxy for the Ki-67:PP1 interaction, but without validating any of their conclusions on Ki-67 itself, which makes the link to the original eLife paper rather tenuous. The Ki-67 and RepoMan motif-PPI structures are quite interesting because the peptide forms a β-hairpin, with its N-terminal part being positioned on the usual RVXF binding site of PP1, but with its C-terminal part turning around 180 degrees, in contrast to other PP1 structures where the polypeptide chain continues more or less straight on the PP1 surface, often establishing a second main contact at the SILK binding site. However, whether Ki67 and RepoMan are the only ligands for this new binding site on PP1, as the authors claim, is not clear, as it may well be that motifs with divergent or even unrelated sequences bind at the same site. Regulation of RV(S/T)F sites by Aurora B kinase has already been established (most notably, for the N-terminal region of Knl1/CASC5), as has the control by Aurora B of RepoMan recruitment to chromatin. 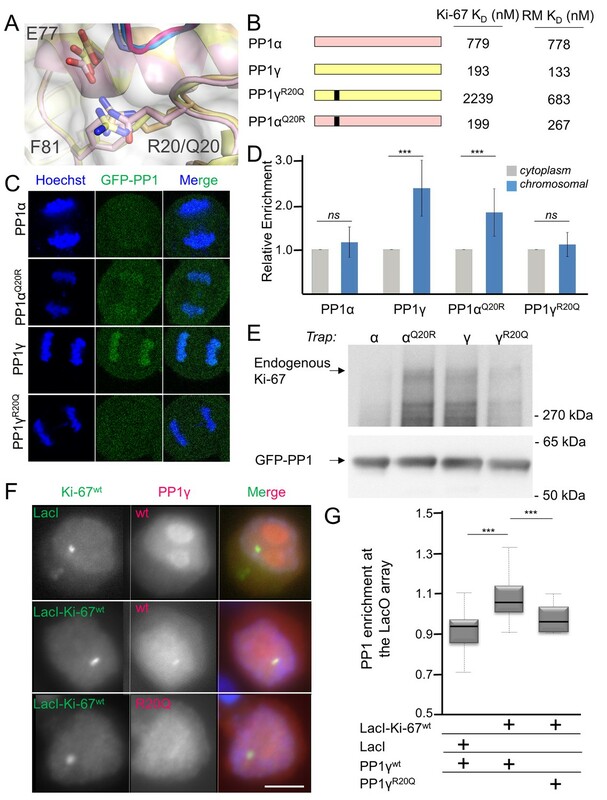 Moreover, no direct evidence of the functional importance of the reported RepoMan and Ki-67 interactions with PP1γ for progression through mitosis is provided, for instance as assessed by expressing appropriate mutants in knockdown cells. Taken together, the three editors who reviewed this paper are not convinced that these studies constitute a sufficiently substantial advance on Booth et al. to justify publication as a Research Advance in eLife. We return a high proportion of articles to authors without passing them on for in-depth peer review so that they can be promptly submitted elsewhere. This is not meant as a criticism of the quality of the data or the rigor of the science, but merely reflects our desire to publish only the most influential research. We wish you good luck with your work and we hope you will consider eLife for future submissions. Thank you for submitting your article "Molecular Assembly of the Ki-67 and RepoMan Mitotic Phosphatases: Regulators of Chromatin Organization and Structure" for consideration by eLife. Your article has been reviewed by three peer reviewers, one of whom is a member of our Board of Reviewing Editors, and the evaluation has been overseen Tony Hunter as the Senior Editor. The reviewers have opted to remain anonymous. This Research Advance by Kumar et al. defines the mechanism by which RepoMan (RM) and Ki-67 interact with the PP1γ catalytic subunit. The authors use crystallography, ITC and cell imaging to characterize these interactions. The two main findings are that: (i) RM and Ki-67 interact with PP1γ through a common structural mechanism involving an extended structure that includes the RVxF SLiM, the ΦΦ SLiM and a novel motif they refer to as the KiR SLiM. (ii) The authors define a structural mechanism for the selectivity of RM and Ki-67 for the PP1gamma isoform relative to PP1α as being due to Arg 20 in PP1γ compared to Gln20 in PP1α. By substituting Arg for Gln, the authors convert PP1α to PP1γ -like and vice versa. These results are of interest and warrant publication in eLife, subject to the following important corrections and clarifications. Second paragraph of Introduction section: A recent paper in Nature sheds light on an important function of Ki-67 and the authors might elect to cite it. The discussion on binding specificity of RM and Ki-67 for isoforms of PP1 is limited to the α and γ subunits, but the authors do not mention the β subunit anywhere. This point should be discussed. Fifth paragraph of Results section: "GFP-Traps showed that GFP- PP1γ and GFP-PP1αQ20R bind […] in prometaphase-arrested cells". This is an important point. If the authors' theory on phosphoregulation of the interaction is correct, there ought to be no binding in prometaphase. Please clarify. Is Panel 3C cited anywhere in the text? First paragraph of Conclusion section: There is additional prior art on the role of PP1 in the control of mitotic checkpoint function, in particular the paper from the Funabiki laboratory (Rosenberg et al. Current Biology 21:942). Please cite it. Panel 2F: The upper left panel is probably not the WT Ki-67 sequence, but the positive control GFP-LacI. In panel G, the authors could clearly indicate that they are comparing GFP-LacI to GFP-LacI-Ki67. Please add molecular weight markers to all gels. 1) The statement beginning in the first paragraph of the Results section. ' […] this conserved region[…] constitutes the full PP1 interaction domain'. I could not find evidence for this statement. 2) Also in the same sentence, given the data presented at this point, the comment that 'Ki-67 and RM interact with PP1 using identical mechanisms' is unsubstantiated. Their structural data presented later does give credence to this view. 3) Figure 1B should indicate the Kd and the name of the interaction proteins. 4) Figure 1F should also indicate the Kd and the name of the interaction proteins and also indicate what ΔKiR-SLiM actually is. 5) Third paragraph of Results. The authors identify a new SLiM using HMMER. Did the authors test the role of consensus residues in this motif, for example F517/F404, P523/A416? 6) The authors suggest that Arg20 of PP1γ confers selectivity for RM and Ki-67. The equivalent residue in Gln in PP1α. Unfortunately neither the structure shown in Figure 2A nor the text explains how Arg20 confers this selectivity. What residues on RM and Ki-67 does Arg20 interact with? Are these conserved between RM and Ki-67? 7) The labels in Figure 3B aren't clear. We thank the reviewers for their assessment that the work is of interest. We believe that the findings do have the potential significance required for the publication in eLife and address this concern, in addition to the specific concerns of the reviewing editors, below. We have made the appropriate changes to the manuscript itself, including 12 new experiments (4 new GFP cellular trapping experiment, 2 tethering experiments, 4 ITC measurements and 2 NMR experiments) and 8 revised figures. The main linkage between this paper and the original paper in eLife, which justifies this as a Research Advance, is the crystal structure of the Ki-67 motif bound to PPI. We appreciate that the reviewers agree that this work is justified as a Research Advance due to its original link with Booth, et al. (Booth et al., 2014). This new structure is very similar to that of the homologous RepoMan motif bound to PP1γ, which would have been predicted based on the very strong similarity of the PP1-binding motifs of these proteins. As stated above, this statement is incorrect. This is because the RepoMan:PP1 holoenzyme structure has never been published (3 different PDBids for all novel structures are provided in the manuscript). Rather, it is this manuscript reports both the Ki-67:PP1 and RepoMan:PP1 holoenzyme structures—i.e., they are both new structures that were not known prior to this work. Furthermore, although the ~30 aa sequence conservation between Ki-67 and RepoMan had been identified in the original paper, it was not known until our study that this sequence corresponds to the full PP1 interaction domain for both proteins. The only residues previously identified to interact with PP1 correspond to the well-established RVxF motif. Thus, it is this Research Advance manuscript that demonstrates that residues beyond the RVxF motif are essential for binding PP1 and that they bind PP1 in a manner never observed for any other PP1 regulator. This is a major advance for the field and is why we feel that the finding presented have the significance required for publication in eLife. In the rest of the manuscript the authors used the RepoMan:PP1 interaction as a proxy for the Ki-67:PP1 interaction, but without validating any of their conclusions on Ki-67 itself, which makes the link to the original eLife paper rather tenuous. We discovered (and describe in this manuscript) that the Ki-67/RepoMan PP1 interaction motifs are exceptionally well-conserved, bind PP1 with identical affinities and bind PP1 via an identical mechanism, as demonstrated by our multiple PP1 holoenzyme crystal structures (Ki-67:PP1γ, RepoMan:PP1γ and RepoMan:PP1α). These data already strongly suggest that the results obtained from RM will be valid for Ki-67. However, we understand the concern of the reviewers and thus have repeated all of the experiments using Ki-67 to experimentally demonstrate this is the case. 1) GFP-trapping experiments. We performed new GFP-trapping experiments with both wt PP1 isoforms (PP1γ and PP1α) and PP1 isoform variants (PP1γR20Q and PP1αQ20R). The results show that only PP1γ and PP1αQ20R effectively trap endogenous Ki-67 (Figure 2e). These results mirror that obtained for RM (Figure Supplement 4c). 2) Tethering experiments. We performed new tethering experiments with GFP-Laci-Ki-67 and RFP-PP1 (PP1γ or PP1γR20Q) in Chicken DT40 cells. The results show that only PP1γ co-localizes with GFP-Laci-Ki-67 at the LacO array (Figures 2f and 2g). These results mirror what was observed for RM (Figures 2d and 2e). 3) ITC experiments. We performed new ITC experiments with Ki-67 and PP1α, PP1γR20Q and PP1αQ20R. We also performed ITC experiments with Ki-67S507D and PP1γ. The results show that the affinity of Ki-67 for PP1α is weaker than that for PP1γ, the affinities reverse with PP1 variants PP1αQ20R and PP1γR20Q, and that the phosphomimetic mutation of Ki- 67S507D profoundly weakens the affinity of Ki-67 for PP1γ (Table 1, Figure Supplement 1). These results mirror what was observed for RM (Table 1, Figure Supplement 1). 4) NMR/phosphorylation experiments. We performed new NMR and mass spectrometry experiments with Ki-67 and Aurora B kinase. The results demonstrate that only Ki-67 residue S507 is phosphorylated by Aurora B kinase (Figure 3c). This result mirrors that obtained for RM (Supplemental Figure 4). The Ki-67 and RepoMan motif-PPI structures are quite interesting because the peptide forms a β-hairpin, with its N-terminal part being positioned on the usual RVXF binding site of PP1, but with its C-terminal part turning around 180 degrees, in contrast to other PP1 structures where the polypeptide chain continues more or less straight on the PP1 surface, often establishing a second main contact at the SILK binding site. We agree that these structures are “quite interesting”. This is the first time such an interaction has ever been observed with PP1, the phosphatase that dephosphorylates more than 50% of all ser/thr residues in humans. Although PP1 has been studied for decades, a mechanistic understanding of how its regulators bind and direct PP1 activity is only just now beginning to be understood. Prior to our study, the only residues in RepoMan and Ki-67 identified to bind PP1 were the canonical RVxF motif. Here, we used NMR spectroscopy and ITC to identify the full PP1 binding domain, which revealed that the PP1 interaction domain extends beyond the RVxF interaction motif to bind PP1 via a novel mechanism and at a novel interaction site that not only enhances binding, but also mediates PP1 isoform selectivity. We then determined the crystal structures of three different holoenzyme complexes to demonstrate that this is the case: (1) Ki- 67:PP1γ, (2) RepoMan:PP1γ and (3) RepoMan:PP1α. However, whether Ki67 and RepoMan are the only ligands for this new binding site on PP1, as the authors claim, is not clear, as it may well be that motifs with divergent or even unrelated sequences bind at the same site. Over the last ~15-20 years it has been well established that the PP1 binding pockets (such as the RVxF, SILK and Arg binding pockets) bind to motifs with very limited variation in sequence (Choy et al., 2014). For example, the RVxF motif of known PP1 interactors contains a ‘V’ in 94% of the sequences (the remaining 6% contain an ‘I’) at the ‘V’ position and an ‘F’ in 83% of the sequences (‘W’ in the remaining 17%) at the ‘F’ position. Similarly, the SILK motif varies only in the first residue, being either G or S (i.e., [G/S]ILK). Thus, contrary to the hypothesis put forward above, the protein-protein interaction sites in PP1 have, in fact, strict requirements for the sequence motifs that bind at these sites. Indeed, this is identical to what is observed for substrates and regulatory proteins that bind calcineurin (which bind PxIxIT and LxVP motifs) (Grigoriu et al., 2013), PP2A (LSPI motifs) (Qian et al., 2015) and also defines the sequence specificity of multiple enzymes, like kinases (e.g. PKA, RRxS/TΦ, CDK, S/TPxK/R, or the D-motif for substrate recognition of MAPKs, among 10’s and 100’s of other examples). This demonstrates that protein-protein interaction pockets bind to specific sequence motifs and, in this way, achieve specificity. Thus, there is no reason not to expect the same strict sequence requirements will be required for binding the KiR-SLIM binding pocket on PP1. Indeed, this is the reason why numerous efforts are ongoing to target these sequences in the pharmaceutical industry (including Vertex Pharmaceuticals & Reflexion Pharmaceuticals) and academia. Regulation of RV(S/T)F sites by Aurora B kinase has already been established (most notably, for the N-terminal region of Knl1/CASC5), as has the control by Aurora B of RepoMan recruitment to chromatin. The specificity of phosphorylation events in time and space are critical for the exceptional fidelity of phosphorylation signaling (arguably, it is this reason why the 100s of phosphoproteomics studies performed in the last decade have been so informative). Our observation that Aurora B kinase specifically phosphorylates Ki-67/RepoMan at their RVxF motifs is a key novel discovery as it explains how and when these holoenzymes assemble during the cell cycle. Although some RVxF sites have previously been demonstrated to be regulated by phosphorylation (i.e., PNUTS and Gm by PKA; KNL1 by Aurora B kinase), this manuscript describes the first time that the interaction of RepoMan or Ki-67 with PP1 has ever been demonstrated to be regulated by Aurora B kinase. This is important because it reveals a new mechanism by which the assembly of the Ki-67/RepoMan holoenzymes are regulated during the cell cycle. Namely, the phosphorylation of Ki-67 and RepoMan by Aurora B kinase explains why Ki-67 is maintained in a phosphorylated state in early mitosis and why the RepoMan:PP1 holoenzyme is largely excluded from chromatin prior to anaphase onset–neither can bind and form stable holoenzymes with PP1. As noted by the reviewers, Aurora B augments this effect by phosphorylating a second site on RepoMan (Ser817; ~400 amino acids away from the RVxF 5 motif) to further prevent it from binding chromatin. Thus, our discovery that Aurora B phosphorylates a second site, the RVxF site, is not only novel, it also demonstrates that Aurora B phosphorylation of RepoMan results in two distinct mechanisms for reducing the premature targeting of PP1 to chromosomes prior to anaphase onset. Both of these are important and our results provide a new understanding of how these holoenzymes are regulated during the cell cycle. Moreover, no direct evidence of the functional importance of the reported RepoMan and Ki-67 interactions with PP1γ for progression through mitosis is provided, for instance as assessed by expressing appropriate mutants in knockdown cells. In fact, just the opposite is true. Namely, our structural, biochemical and cell biological studies now explain a number of pieces of data concerning Ki-67 and RepoMan the functional importance of Ki-67 and RepoMan during the cell cycle. First, previous work has demonstrated that overexpressing a RAXA mutant of RepoMan (which inhibits PP1 binding; see Figure 3a in the current manuscript) in HeLa cells results in the displacement of PP1γ from chromatin. This results in an adverse effect on cell viability, as almost no mitotic cells and very few interphase cells are detected expressing high levels of this mutant and a much larger level of cell death was observed (Trinkle-Mulcahy et al., 2006). Similarly, a study by one of the authors of this manuscript demonstrated that phosphorylation of RepoMan at three distinct sites (Ser400, Ser412 and Ser419) also inhibits PP1 binding (Qian et al., 2015). Conversely, mutating these residues to alanine (non-phosphorylatable; 3A variant) results in the binding of PP1 to RepoMan prior to anaphase onset (these mutants were expressed in knockdown cells) and causes the precocious dephosphorylation of mitotic-exit substrates. Our work reveals also how this functional result is achieved at a molecular level--namely, that all three of these residues are part of the PP1 interaction motif and thus, their phosphorylation directly inhibits PP1 binding. Taken together, these data demonstrate the essential role of RepoMan in cell viability is directly related to its PP1-targeting activity. Second, when endogenous Ki-67 is replaced by a Ki-67 RASA mutant (which cannot bind PP1), the accumulation of PP1γ on chromosomes is reduced (Booth et al., 2014; Takagi et al., 2014). However, the formation of daughter nuclei are not notably affected. This mild phoenotype is consistent with that observed for cells in which Ki-67 is knocked-down completely. Thus, Ki-67 is less important for mitosis and viability than is RepoMan. Third, both Ki-67 and RepoMan were previously demonstrated to be specific for the gamma isoform of PP1 (Booth et al., 2014; Trinkle-Mulcahy et al., 2006). We show unequivocally that this specificity is due to the recognition of a single residue within the PP1 catalytic domain by these regulators, Arg20. This is a fundamental new discovery that now explains a plethora of other papers that observed but did not explain this isoform specificity e.g. for nucleolar targeting. In conclusion, the importance of these regulators in cell viability and mitosis, in spite of their conserved PP1 interaction motif, differ. This is because the only residues that the two proteins have in common are the short ~30 amino acid PP1 interaction motif; the rest of the sequences are divergent. As stated above, knock-down studies with RepoMan demonstrate that it is critical for viability. The importance of PP1 binding for this function of RepoMan was demonstrated by transfecting a PP1-deficient mutant (RAxA) which led to a large level of cell death. In contrast, 6 similar studies with a Ki-67 RAxA mutant resulted in mild phenotypes, similar to those observed from cells with Ki-67 knocked down. We have edited the text accordingly to more explicitly address these points. We have included a sentence about the newly discovered function of Ki-67 and have also cited this paper. Ki-67 binds to both PP1γ and PP1β. This is not a surprise, as PP1β has the same primary sequence as PP1γ in the newly identified selectivity sequence – only PP1α is different. This now explains data presented in the eLife article on which this research advance is associated with (Reference 1). Namely, Booth et al. (2014) used a tethering/recruitment assay (such as that illustrated in Figure 2F) to show that LacI-Ki-67301-700 recruits both PP1γ and PP1β to a LacO array in DT40 chicken cells. This work also showed that PP1γ is recruited more efficiently than PP1β. Furthermore, pull-down experiments coupled with SILAC to identify RepoMan interactors whose binding was enriched in anaphase also identified both PP1γ and PP1β, but not PP1α (see reference 21). Finally, we now also show in this current report that PP1β co-immunoprecipitates with RepoMan and this binding is reduced when the corresponding arginine is mutated to Q (R19Q); this data is now included in “Supplemental Figure 5”..
“in vivo, Ki-67 and RepoMan bind specifically to the β- and γ-isoforms, but not the α-isoform, of PP1 (as PP1γ is recruited more efficiently than PP1β, we focused our study on the PP1α and PP1γ isoforms). The binding of PP1 to RepoMan is indeed much less prominent in (pro)metaphase than in anaphase because the binding of PP1 is then opposed by phosphorylation of the PP1-binding domain of RepoMan by Cdk1 (see reference 29) and Aurora B (this work). However, the PP1-RepoMan interaction in (pro)metaphase, although less pronounced, can clearly be demonstrated and is essential to dephosphorylate histone H3T3 at the chromosome arms and thereby contributes to the centromeric targeting of Aurora B (see reference 29) and also “Figure Supplement 4”. Panel 3C was cited in the text (subsection: “Dynamic regulation of PP1y recruitment by Aurora K Kinase”), but an adjacent supplemental citation was referenced incorrectly making it hard to read. This has been fixed. As requested, MW markers have been added to the gels. This data was further corroborated by NMR spectroscopy as also described in the manuscript. We appreciate the reviewer’s insights and agree that in spite of the similar sequences and binding affinities, without the structural data the view that both Ki-67 and RepoMan interact with PP1 using identical mechanisms is premature. Hence, we have edited this sentence to replace ‘demonstrate’ with ‘suggest’. Edited both the figure and the legend as requested. We tested the role of RepoMan variant F404A in vivo (as measured by monitoring H3T3 phosphorylation). The data show that, alone, this mutation is not sufficient to negatively impact RepoMan function. Thus, the binding strength provided by the additional portions of both the KiR-SLiM and the RVxF/ΦΦ SLiMs are sufficient to overcome this mutation in vivo. However, as we show in Figure 1B, removing the SLiM altogether does negatively impact binding, demonstrating its importance. The mechanism is as follows. The Arg20 sidechain forms: (1) a salt bridge with PP1 residue Glu77 and (2) makes a strong planar stacking interaction (cation/π interaction) with PP1 residue Phe81. Important – neither interaction is possible with the uncharged, shorter Gln20 residue in PP1α. Thus, Arg20 stabilizes the interaction between PP1 loop 1 (residues 19-26) and the remainder of the PP1 catalytic core. This is consistent with our previous data – in the multiple PP1α structures we have determined to date (4XPN, 4MOV, 4MOY, 4MP0, 3V4Y, 3EGG, 3EGH, 3HVQ, 3E7A, 3E7B), the density for PP1α loop 1 is generally the weakest in the entire structure (even in the 1.4 Å maps, 4MOV). In contrast, in PP1γ structures, the electron density of this loop is consistently better. This is also consistent with the B-factors of this loop: the average increase of the main chain B-factors for this loop (normalized against the average B-factor) are consistently higher for PP1α than PP1γ. Together, these data demonstrate that only in PP1γ is this defined pocket is readily available for binding, which, as a consequence, leads to the isoform specific interaction of RM and Ki-67 for PP1γ. This is now more clearly described in the text (Results section, subsection: “The specific recruitment of PP1y by Ki-67 and RepoMan”). The tops of the labels of Figure 3B were inadvertently cut-off and have been fixed. RP, Conception and design, acquisition of data, analysis and interpretation of data, drafting or revising the article, all authors discussed the data and manuscript. The authors thank Dr. R Bajaj for providing Aurora B kinase and Mr. Haejun Cho for help with Ki-67 expression and purification. This research is based in part on data obtained at the Brown University Structural Biology Core Facility, which is supported by the Division of Biology and Medicine, Brown University. Crystallographic data were collected on beamline 12.2 at the Stanford Synchrotron Radiation Lightsource and X25 at the National Synchrotron Light Source. Use of the Stanford Synchrotron Radiation Lightsource, SLAC National Accelerator Laboratory, is supported by the U.S. Department of Energy, Office of Science, Office of Basic Energy Sciences under Contract No. DE-AC02-76SF00515. The SSRL Structural Molecular Biology Program is supported by the DOE Office of Biological and Environmental Research, and by the National Institutes of Health, National Institute of General Medical Sciences (including P41GM103393). The National Synchrotron Light Source is supported principally by the Offices of Biological and Environmental Research and of Basic Energy Sciences of the United States Department of Energy and by the National Center for Research Resources of the National Institutes of Health. The contents of this publication are solely the responsibility of the authors and do not necessarily represent the official views of NIGMS or NIH. © 2016, Kumar et al. Daniel G Booth et al.